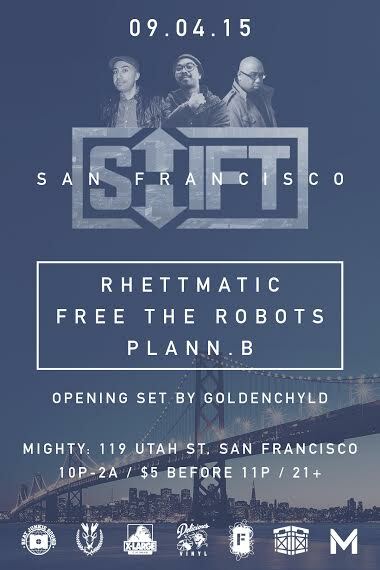 Our very own Rhettmatic as well as his comrades Free The Robots & Plann B have released a special mix in honor of their Shift parties that they have been doing for the past 6 years in both at The Crosby (OC) & Escala (LA). 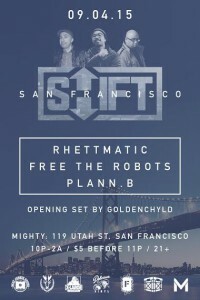 In the last month, they took their Shift parties on the road to Palm Springs, Las Vegas, & now San Francisco (this Friday, Sept. 4th). The good people at Okayplayer World Premiered the mix this morning! “We tried to put together a mix that would sound exactly like a typical night inside Shift…basically an hour of heavy musical ADD. I think we nailed it.” That’s how Plann.B describes the new hour-long, three-part SHIFT All City mixtape, a joint venture that has him welding his talents to those of Free The Robots and DJ Rhettmatic. In 2009, the three DJs conspired to create a new enterprise that doled out hip-hop, soul, futuristic funk and electro in a format that pulled no punches and honored no idols; a beat music free for all lead only by their brainiac techniques. 6 years on, Shift is as vital as it’s ever been and has filled massive rooms alongside the likes of Dam Funk, J. Rocc, House Shoes, Soulection and more. 10. Thugli – What Happened? 18. Raven – Is It Real?